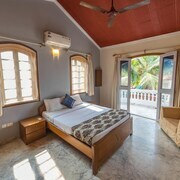 Situated in the historical district, this guesthouse is within a 10-minute walk of Candolim Beach and Fort Aguada. 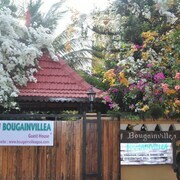 Calangute Beach is 3 mi (4.9 km) away. 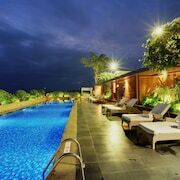 Situated near the beach, this hotel is within 1 mile (2 km) of Sinquerim Beach, Candolim Beach and Fort Aguada. Calangute Beach is 2.8 mi (4.5 km) away. The property was well maintained with friendly staff. Best hospitality ever I had. I would strongly recommend. One of the best service I’ve received in India in a Long time. We weren’t very happy with our room and the staff took the time to acknowledge that and within 24 hours offered to upgrade us. They were all super helpful during the stay and it was an absolute pleasure interacting with anyone at the restaurant to the front desk to the travel desk. The amenities were great as well and excellent food! I’d definitely stay here again. 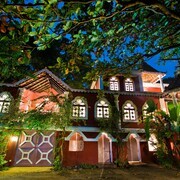 Families will find kid-friendly activities in Aguada Fort Area, and visitors give high marks for the top-notch restaurants. This relaxing city also attracts tourists with its beaches. 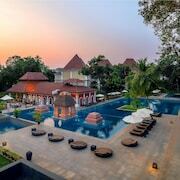 Top sights in the city include Fort Aguada, Sinquerim Beach and Candolim Beach.